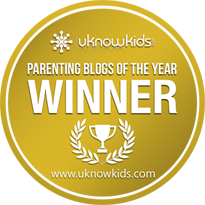 uKnowKids Parenting Blog of the Year Winners! We are extremely excited to announce our first annual Parenting Blog of the Year winners. We listened to our readers recommendations and scoured the web for the 25 best mommy/daddy bloggers and then we left it up to you to vote and decide who wins from there! Readers voted like crazy from mid-June to the first week of July, and the top 5 winners went home with some great prizes including gift cards, free uKnowKids accounts, press opportunities, and more!